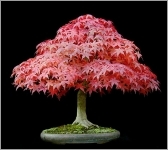 Acer palmatum atropurpureum, Redleaf Maple, is native to Japan, China and Korea. This tree has beautiful red leaves very decorative and non-persistent. Leaves with 5 lobes are bright red in spring and autumn, purple in summer. The tree can reach 3 to 5 meters in height. 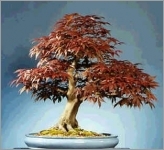 With its remarkable silhouette and beautiful purple foliage, Acer Palmatum Atropurpureum is used to make beautiful bonsais.